PASCAGOULA, Miss., Dec. 21, 2007 (PRIME NEWSWIRE) -- Northrop Grumman Corporation (NYSE:NOC) today received a $1 billion U.S. Navy shipbuilding contract to build a ninth San Antonio (LPD 17)-class ship. This 47-month, fixed-price incentive contract modification provides funding to finish design and begin construction on the new amphibious transport dock ship, Somerset (LPD 25). The contract continues momentum in amphibious shipbuilding for Northrop Grumman, which commissioned its third LPD 17-class ship Mesa Verde (LPD 19) last Saturday in Panama City. New York (LPD 21) launched this week and will be christened March 1 in New Orleans. Coupled with the advance procurement contract funded for LPD 25 in November 2006, the total contract is valued at more than $1.2 billion. "These sophisticated expeditionary ships align with our nation's current National Maritime Strategy, and it is imperative our sailors and Marines receive the best we have to offer," said Philip Teel, corporate vice president and president of Northrop Grumman's Ship Systems sector. "We continue to be devoted to building affordable ships of the highest quality. The LPD program will not only maintain this standard, but it will set the bar for other classes to follow." The name Somerset honors the county in Pennsylvania where United Airlines Flight 93 crashed on Sept. 11, 2001, after courageous passengers stormed the cockpit in an attempt to regain control from the terrorists onboard. Their actions prevented the airplane from reaching its destination and inflicting further casualties and damage, and the heroic sacrifice of these 40 passengers and crew rallied and inspired the nation. The San Antonio-class ships, 684 feet long and 105 feet wide, will replace the functions of the LPD 4, LSD 36, LKA 113 and LST 1179 amphibious ship classes. The San Antonio-class ships afford the Navy's Expeditionary Strike Group with the technology and flexibility to launch and recover two amphibious Landing Craft, Air Cushions (LCAC), operate an array of rotary-wing aircraft and carry and launch 14 Marine Corps Expeditionary Fighting Vehicles. 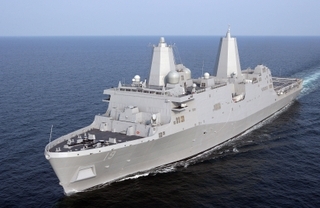 Technological and design advances in the LPD 17 class provide benefits such as enhanced survivability, state-of-the-art command and control, modernized weapons stations and enhanced ergonomics, which greatly improve quality of life at sea for sailors and Marines. This includes "sit-up" berths that allow occupants to sleep horizontally or sit up vertically to read or write. Each berth also has 40 percent more storage space than other ship type berths. The ship will have a crew of 360 officers and enlisted Navy personnel and is capable of embarking a landing force of up to 800 Marines. It has a navigational draft of 23 feet and displaces approximately 25,000 tons. Four turbo-charged diesels power the ship to sustained speeds of 22 knots.